two peas & the dog: food. bi bim bap. Korean food. Always a favourite in my book, usually a favourite for Nate. 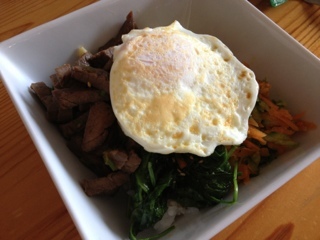 Bi Bim Bap can be considered the Korean "all but the kitchen sink" dish. It's perfect to use up veggies, perfect for a cold day, perfect for a hang over. However, if you have a hang over, you may want to just get this dish from a restaurant. The best Korean restaurants usually look like a hole a in the wall. If your local Korean joint looks like that, go in and try it. It'll probably be delicious. 1. Make the marinade for the beef. Combine the soy sauce, sugars, garlic, green onions, sesame seeds in a large bowl; add the sliced beef strips to the marinade, and season with salt and pepper. Cover, and refrigerate for at least 2 hours. 2. Cook rice (in your rice cooker or on the stove). 3. Bring a saucepan of water to a boil. Add spinach to the water just long enough to wilt the leaves, and then drain and pat dry. Set aside. 4. Combine cucumber and carrots in a bowl, and season with salt and pepper. Set aside. 5. Preheat wok over medium-high heat. Cook carrots and cucumbers in a small amount of sesame oil to soften, stirring frequently. Remove from pan, and set aside. 6. Add a small amount of sesame oil to the pan, and cook spinach in sesame oil for a minute or two. Remove spinach from pan,and set aside. 7. Add a small amount of seasame oil to the pan, and cook the mushrooms for a minute or two. Remove and set aside. 8. Add the meat strips and marinade to the wok; cook, stirring frequently, until the liquid reduces in volume, about 4 to 5 minutes. 9. Divide the rice into the bowls, and gently pack to the bottom. 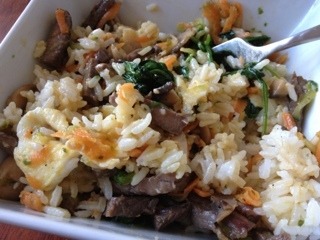 Arrange the cucumbers and carrots, bean sprouts, greens, mushrooms, and beef mixture over each portion of rice. Immediately before serving, add one cooked egg (be sure the yolk is soft), drizzle with about a tablespoon of sesame oil, and top with the nori. Yes, there are a lot of steps but everything goes quickly once you start cooking.